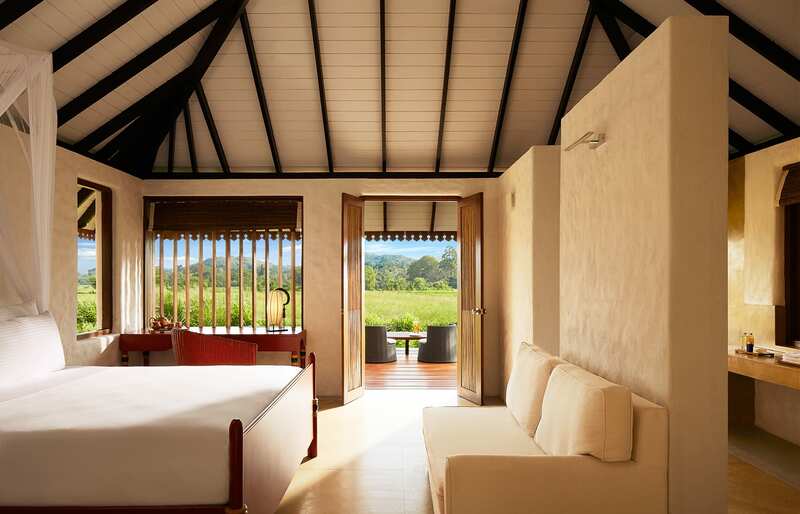 Set in the shadow of the majestic Poonagala Mountains, surrounded by verdant forests and with paddy fields right outside the guest cabins, the Jetwing Kaduruketha promises a taste of rural Sri Lanka at its most enchanting. This was not our first trip to Sri Lanka, so a friend asked: what’s makes you return to the island? This simple question gave us a pause because the answer is not straightforward. There are so many things here that make it a one-of-the-kind destination — a destination infused with unique culture and warm hospitality of its people. 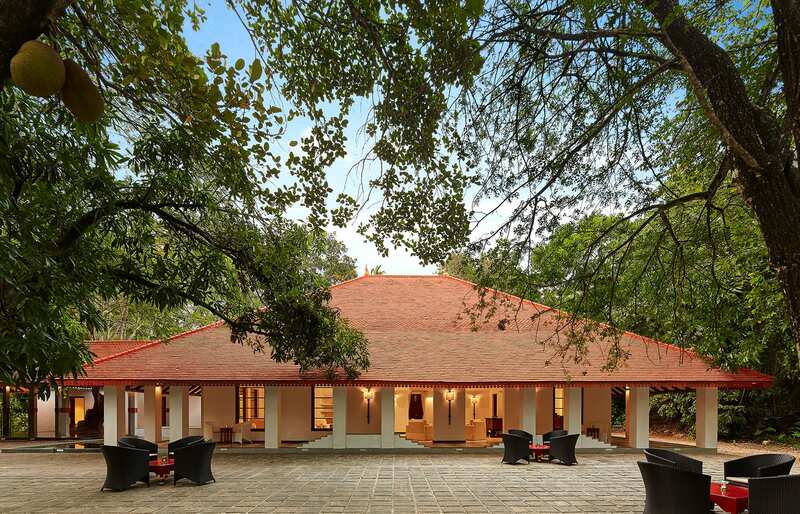 And in many ways, Jetwing Kaduruketha embodies all the best things Sri Lanka has to offer. 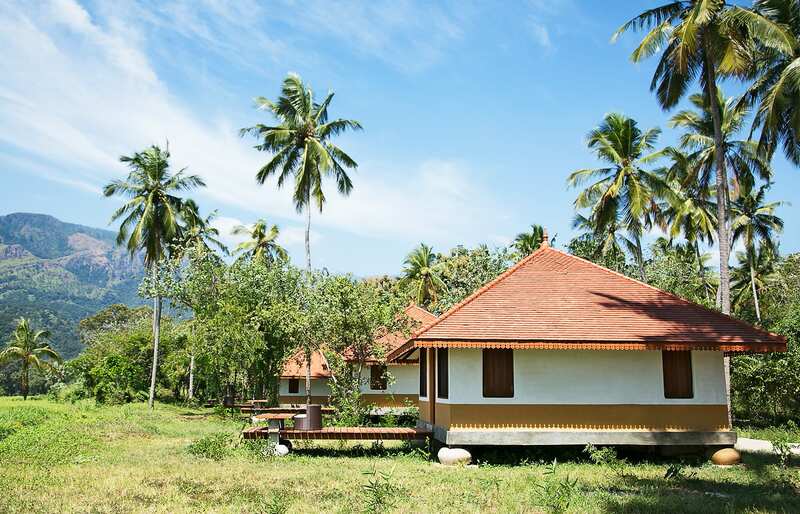 Jetwing Kaduruketha offers an agro-eco-luxury resort experience in the picture-perfect shades of blue and green. 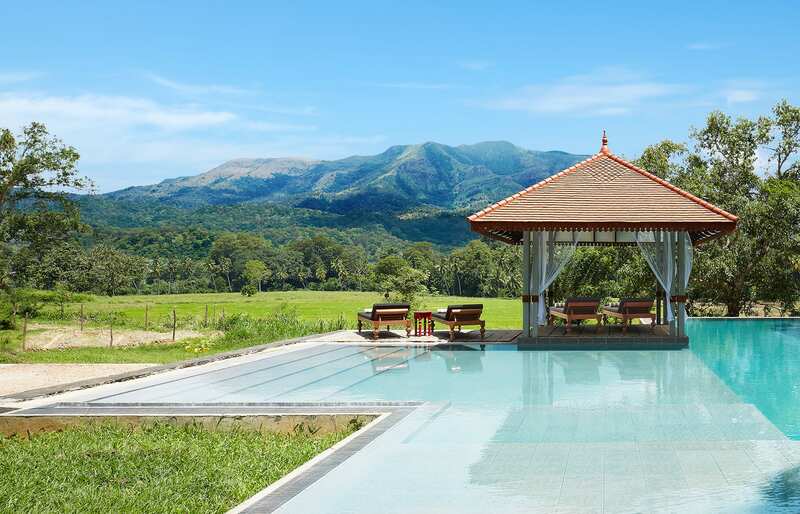 Set in a peaceful village location, near the town of Wellawaya, the place is surrounded by the mountainous landscape and fringed by vast working paddy fields and tropical forest. The area is frequented by wild peacocks, monkeys, frogs, squirrels, and colourful birds. It’s all very picturesque and close to nature — and presents an opportunity to meet the locals and experience the traditions of a rural farming community. The resort is also well placed for exploring the region. Reaching Little Adam’s Peak and the Diyaluma Falls is easy from Kaduruketha. Ella with its Nine-Arch Bridge and the railway station is nearby too. Many people choose to disembark here after a train journey through the spectacular landscapes of the country. 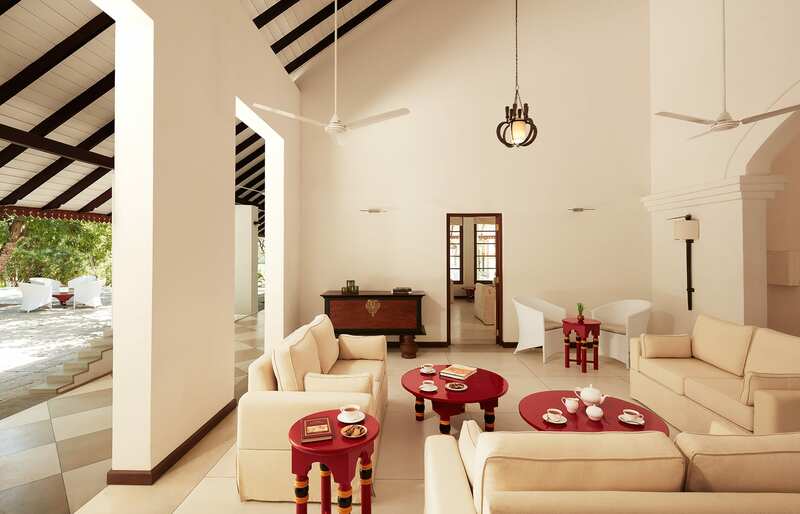 But Jetwing Kaduruketha is first of all a fine resort, with all the comforts that come as part of the experience. 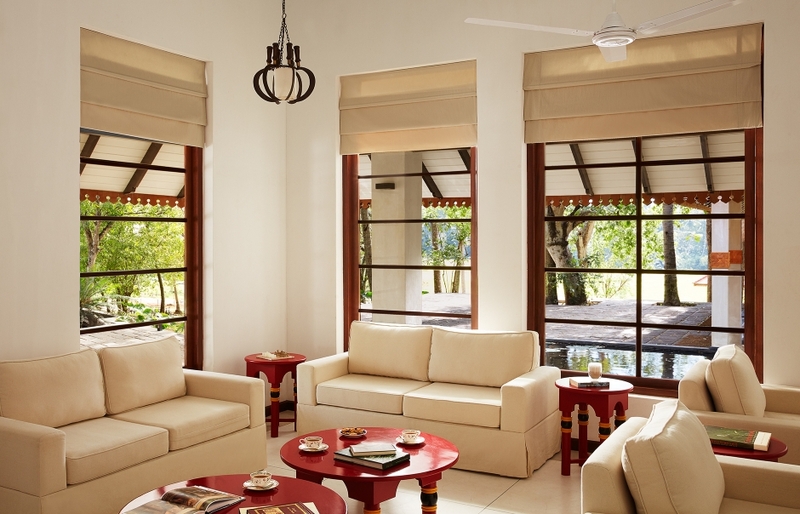 The guest bungalows are designed to utilise natural ventilation. 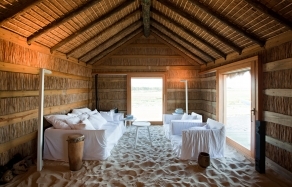 They feature bamboo and wood furniture and the king size bed sports a beautifully-draped mosquito netting. 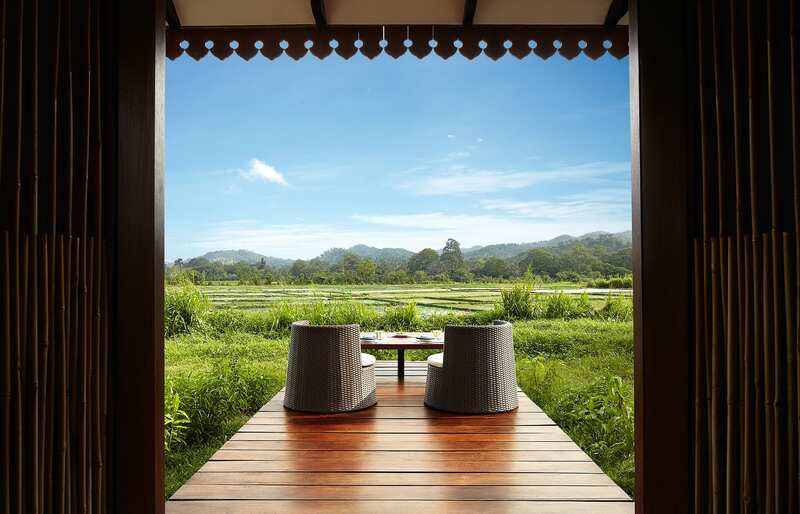 Our spacious, airy bedroom lead to a patio with a low bench that became an excellent site for a picnic slash à la carte breakfast-in-room experience… with a beautiful paddy fields landscape as a backdrop. The main attraction at the resort is the fabulous swimming pool. 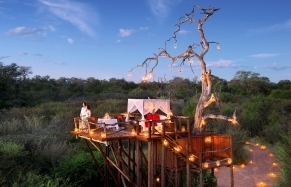 Positioned to maximise the views, it is the best spot from which to gaze at the scenery. There is also the hotel’s open-sided restaurant right here, overlooking the pool. Here a well-composed menu offers a mix of traditional Sri Lankan food, contemporary Asian cuisine, and international dishes. And when done with all the swimming, sunbathing and sightseeing, the next obvious thing is to try out the Ayurvedic Spa and yoga program. 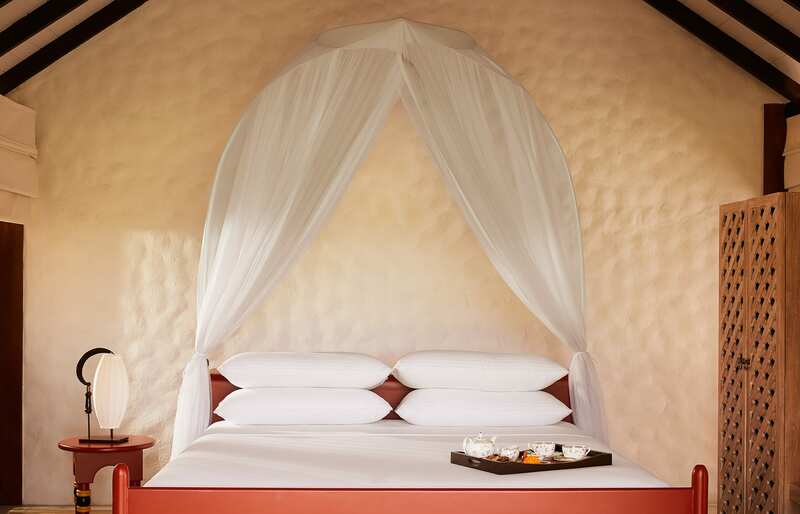 The hotel has three different treatment rooms where to indulge in relaxing massages using traditional herbs and oils. Each guest enjoys services of a personal butler, whose assistance will include advice on local attractions. Among them, the “secret waterfall” (Ella Wala Waterfall) not far from the hotel is a must-visit. The place is isolated, does not have many visitors, and gives the opportunity of swimming under the roaring water. It was one of the highlights for us. 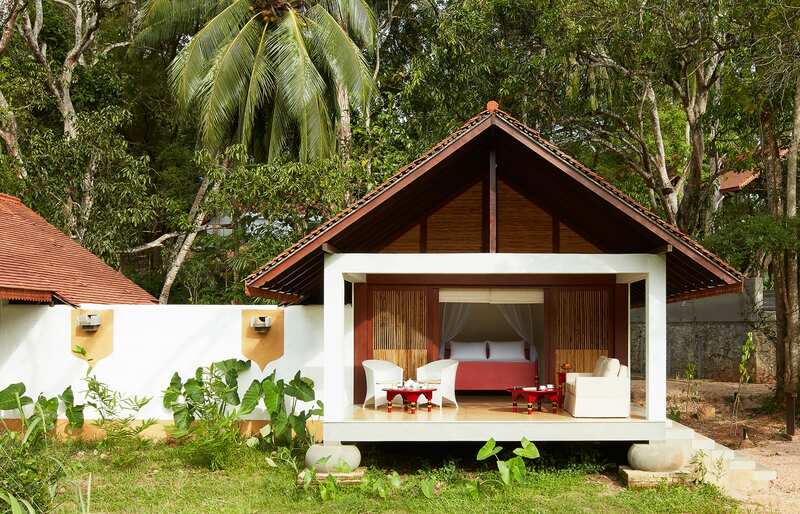 In a sense, Jetwing Kaduruketha has the best of two worlds: the level of service has the hallmarks of a well-established luxury resort, and yet it never loses touch with the rural side of Sri Lanka. 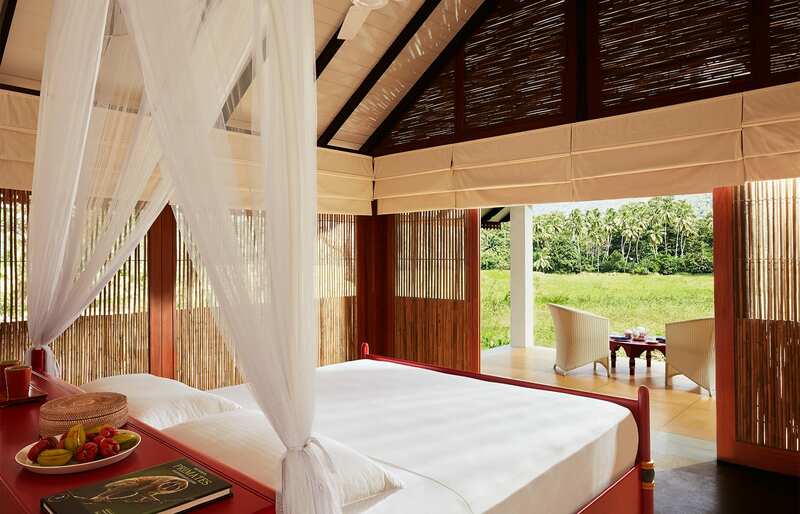 This agro-eco-luxury resort has a real bucolic charm, without compromising on comfort and quality. It's a convenient stopover when getting from the Tea Country to Yala, especially when you want to explore the countryside. 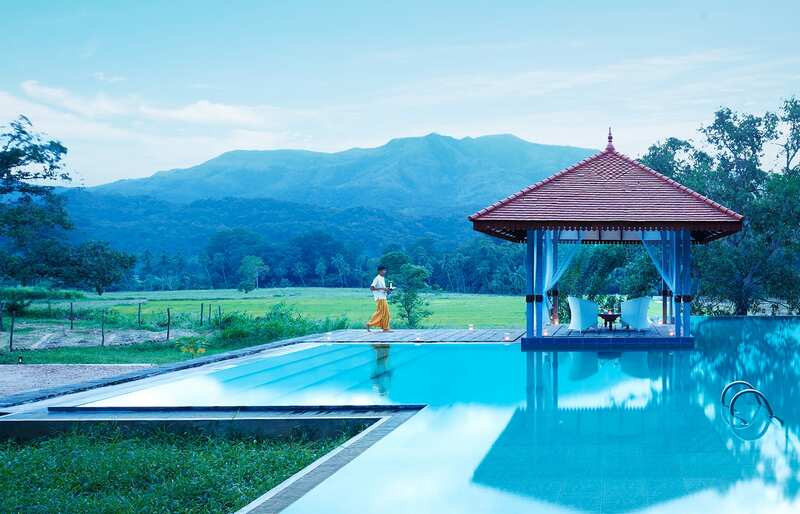 The resort's setting, surrounded by tropical forest, vegetable gardens, paddy fields, meandering streams, and all in the shadow of a distant mountain range. A good night sleep! The hotel is secluded, and the area very peaceful and quiet. Plus, we loved the bed itself. Not only it is very comfortable, but the mosquito net draped over it makes it a very pretty thing indeed. The beautiful infinity pool, positioned to offer the best views, is an eye candy. We loved to hang out here. The food is a la carte, including breakfast. Both Sri Lankan and Western dishes and flavours are on the menu but try the traditional Sri Lankan breakfast at least once. It'll include the traditional egg hoppers and the ubiquitous curries. 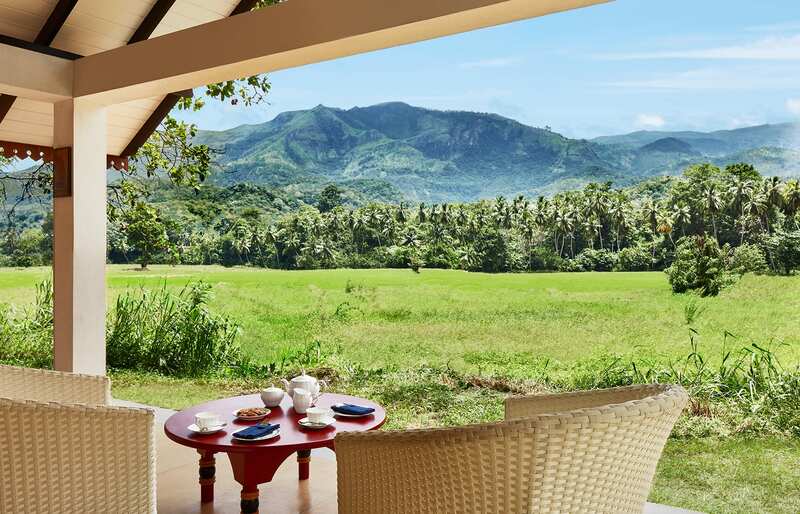 In-room breakfast is at no extra charge — we recommend trying it out, especially if you have the backdrop of the fields and mountain range further away. All guest rooms are supplied with bicycles, perfect for getting around the resort. The town of Ella is at a distance of only forty-five minutes by Tuk-Tuk. Other local attractions are also accessible, including waterfalls (Both the Ella Wala Waterfall and the Diyaluma Falls are 35-45 minutes away). Plus, getting to Yala took us only two hours. It's a good place from which to explore the area. WiFi is complimentary, and, given the hotel's remote location in Sri Lanka, surprisingly fast and reliable. There is no air conditioning in the rooms, but actually, the fan was enough to keep us cool. 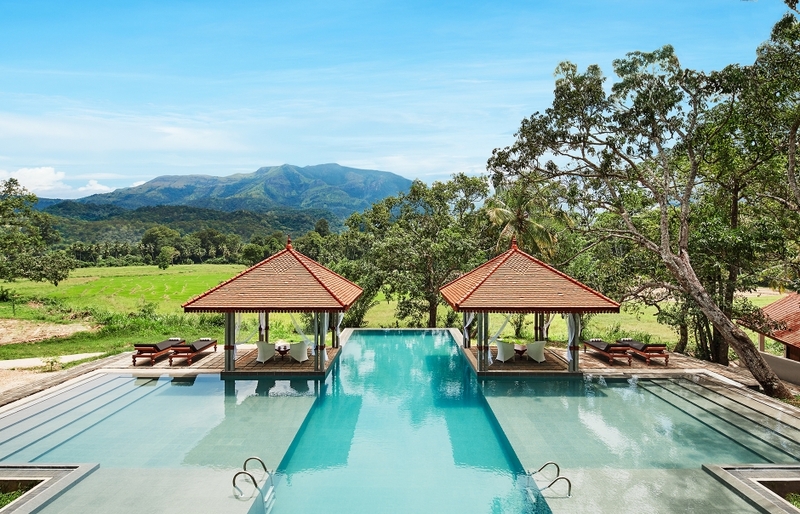 This part of Sri Lanka benefits from the proximity to mountains, and cooler weather. The hotel's location deep in the forests of tropical Sri Lanka means the local fauna is never far away. Expect geckos and huge moths and other critters abound. One thing to keep in mind is that the roads in the country are notoriously bad. This is due to difficult terrain, weather (flash floods are not infrequent), and lacking infrastructure. So even if places seem fairly close in a straight line, travelling between A and B can take surprisingly long. Jetwing Kaduruketha is located at least five hours by car from Colombo. Plan accordingly.